For most, a consistent oral care routine & regular check-ups are all that’s needed for a healthy, beautiful smile. National Dental Hygiene Month is an annual observance designed to celebrate the work of dental hygienists, as well as raising awareness on the importance of good oral health. 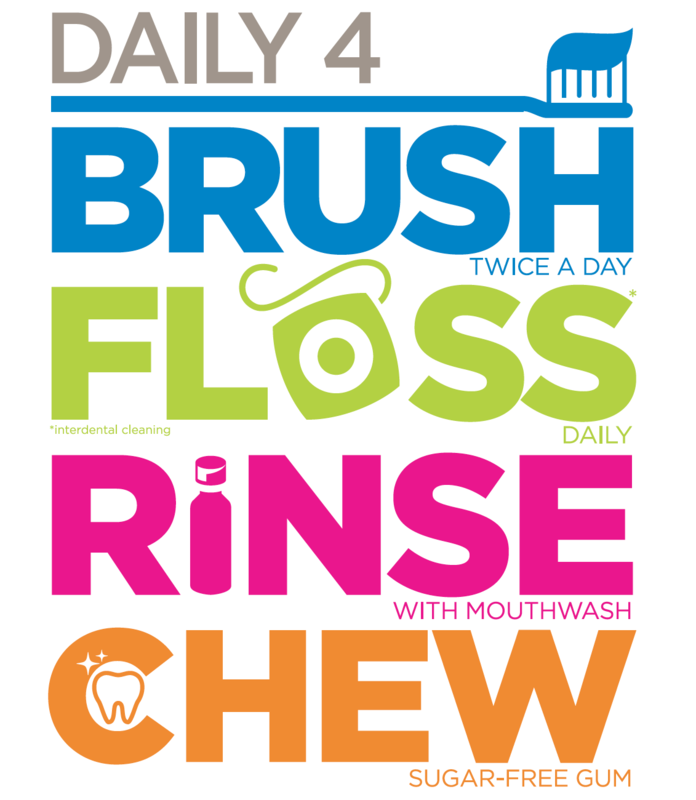 The month-long education effort focuses on the Daily 4, a basic routine that will help you maintain a healthy smile: Brush, Floss, Rinse and Chew. The American Dental Association’s consumer website, MouthHealthy.org, recommends brushing with a soft-bristled brush. Your brush size and shape should fit your mouth to allow you easy access to all areas of your teeth and gums. To clean the inside front surfaces, tilt the brush vertically and make several up-and-down strokes. Cleaning between your teeth is also an essential component of healthy teeth and gums. The ADA recommends cleaning between teeth at least once a day to remove food particles and plaque that brushing may not catch. Because your actual teeth comprise less than half of your mouth, rinsing helps eliminate bacteria and bio-film. Along with brushing and flossing, frequent rinsing can reduce the chance of dental decay or infection. However, you should avoid alcohol-based rinses due to unwanted side-effects in your mouth. Clinical studies show that 20 minutes of chewing sugarless gum after a meal helps prevent tooth decay. Gum-chewing increases the flow of saliva, which helps wash away any remaining food or other debris, as well as neutralizing bacteria-born acids in the mouth and promoting disease-fighting substances throughout the mouth. If your next appointment is during October, remember to high-five our outstanding team of dental hygienists and wish them a Happy Dental Hygiene Month!